One look at this boat’s master cabin and you can see why she was named boat of the year. Anyone familiar with the Mediterranean will know from hard-won experience that the weather isn’t always as it’s shown in the tourist brochures. But a blizzard was a new one on me. A huge low-pressure system had marched in from the Atlantic, and by the time it was centered on Italy, its western sweep was pulling freezing air, at gale force, down from the Alps. Sun-kissed harbors like Portofino and Rapallo, home to the well-heeled and expensively branded during August, suddenly looked like ski resorts. At industrial Savona, the wind howled in from the mountains and snow drifted on rows of shivering decks at Azimut’s R&D and delivery center. But of course it’s not just the weather making it tough to sell boats. European boatbuilders diplomatically describe trading conditions as ‘challenging.’ They’ve been saying that for a long time now, but competition among shipyards seems as hot as ever—and few sectors are as hot as the midrange flying-bridge market. 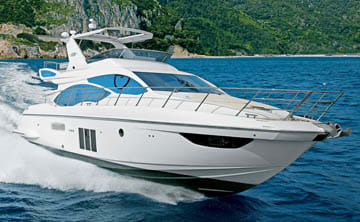 Take Azimut, which introduced its 53 to European customers last fall. The boat takes on strong contenders from both sides of the Atlantic. 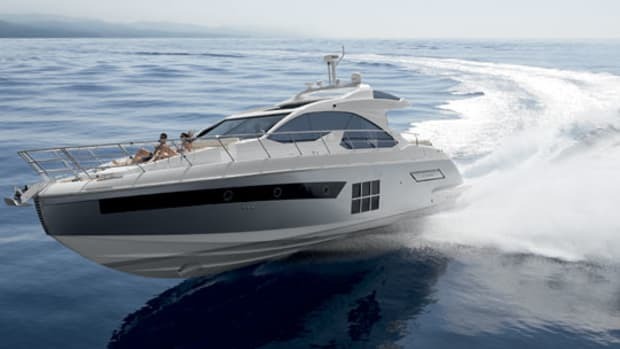 But the builder seems quietly confident—having already won a major (and entirely credible) boat of the year award from the U.K. magazine Motor Boating and Yachting—and it’s not hard to see why. 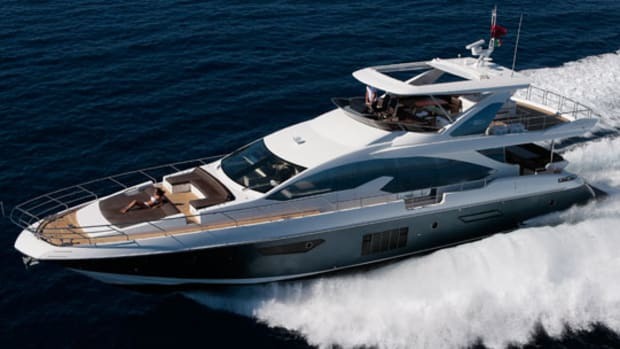 With an overall length closer to 55 feet than 53, the new model packs a lot into that space, and nowhere is this more apparent than in the owner’s suite. 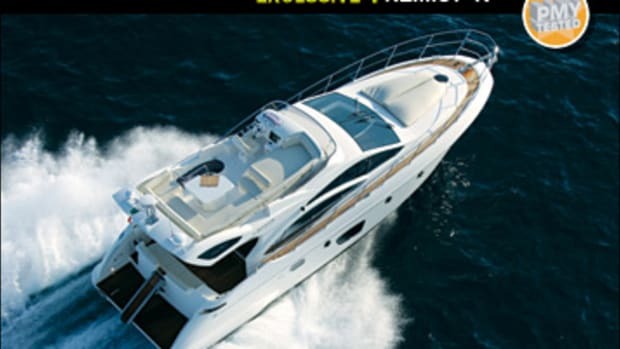 It’s a luxurious, full-beam affair of the sort that you see in much larger boats, with big hull windows that extend almost to the waterline, a full-size breakfast dinette, an offset berth, and 6&apos;4" headroom. There are no deckhead intrusions to betray the fact that there’s another deck just above your head, and the vee of the hull is cleverly disguised. Only the height of the dinette, hard up against the port side, might remind you that you’re not onboard something bigger. This spatial sleight of hand continues in the master head compartment where there is a big shower stall at the forward end and plenty of floor space. Cleverly, the mirrors on the locker doors are angled upwards so any supermodels in your party won’t have to bend down to admire their reflections. There is also plenty of stowage space: two proper hanging lockers, the set of drawers in the forward bulkhead, three other useful lockers, and finally, under the mattress. By the time you’ve settled yourself in here, you’ll be convinced you bought the 62 by mistake. Unfortunately, that illusion won’t last. 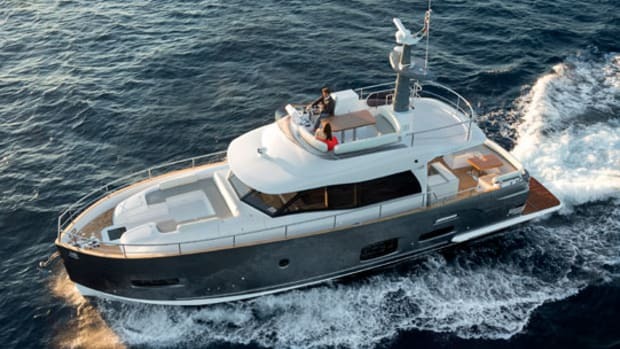 The second head compartment, shared by the forepeak VIP and the twin-berth guest cabin to starboard, is definitely on the small side, though cleverly designed to make the best of it. The VIP is well proportioned, and the bed is the same size as the owner’s: 6&apos;6"x5&apos;2". Big hull windows let in lots of light, and although set well forward, the berth is at the proper height, with headroom at its foot just under 6&apos;5". In spite of the two hanging lockers and the others over the windows, stowage in the VIP might be a little short for a long cruise— a trait shared by the guest cabin, which has just a single hanging locker and one small locker between the beds. That said, the guest stateroom is also a perfectly comfortable cabin for two, with an opening porthole, a fair expanse of floor space, and generous headroom of more than 6&apos;5". It is really only the area devoted to the owner’s suite that makes the other cabins seem in any way wanting, but few owners I know will have a problem with that. Up on the main deck everything is a lot more democratic. The excellent galley is on the same level as the dinette, with great views all round and a very sociable aspect. The dinette is right next to the helm—in fact these two areas share a particularly cool dual-function seat (see “Noteworthy,” this story)—and both overlook the saloon, with its huge windows, remarkably comfortable sofa, and the big starboard sideboard concealing the TV. Two custom-made stools, designed to stow under the dining table when not in use, can be used as coffee tables. Another clever design detail is found in the glass and crockery lockers, which have strategically placed foam inserts to stop rattles. There is a conventional aft sofa in the cockpit across the transom, with access on each side down to the bathing platform. In the standard form, the 53’s platform is fixed, and the central passerelle doubles as a hoist for the tender. 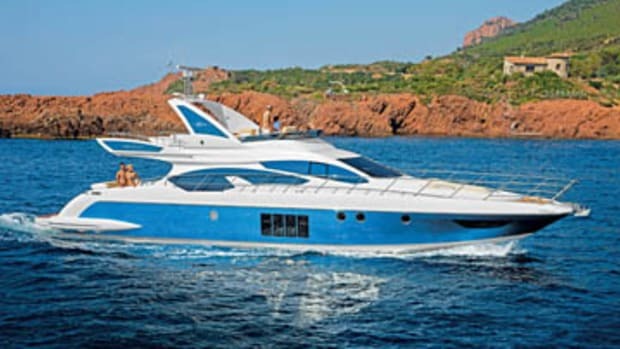 However our test boat, the fourth off the line—along with every other Azimut 53 built so far—had the hydraulic platform, with the passerelle mounted on the starboard side. Upstairs, the flying bridge has plenty of space devoted to sun-worshipping, plus a sofa, table, and an elegantly thin helm console. The hardtop over head has such a large sunroof that the whole structure virtually disappears when you slide it open. Not that we had that sort of weather. The sunroof remained firmly closed as the wind howled and driving snow gathered in the corners of the flying bridge. I would like to say that we donned mitts, balaclavas, and ski goggles and got on with it, and we would have, but unfortunately the boat was trapped in a tight berth with a most unwelcoming concrete corner jutting out ahead, mere feet from where we would be trying to turn across the wind. 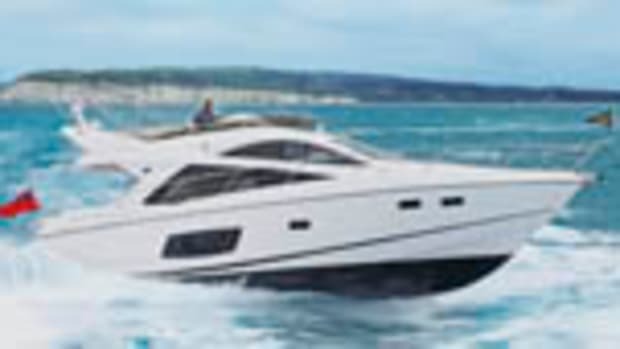 The Azimut crew decided it was too risky for a brand-new boat that hadn’t even met her owner yet, and I couldn’t disagree. So we waited. And waited. Two weeks later (I was allowed to go home), I had another go. This time, conditions were more cooperative. Although Savona is not the sort of place where there is much call for pretty postcards, the city’s rusting industrial port and dour 16th-century fortress did provide a backdrop of gritty grandeur as we ghosted out of harbor in a flat calm. The 53 seemed pleased to be at sea again. Her efficient, moderate-V hull and well-matched propellers gave a real kick to the acceleration, with 25 knots (28.8 mph) coming up in under 18 seconds. 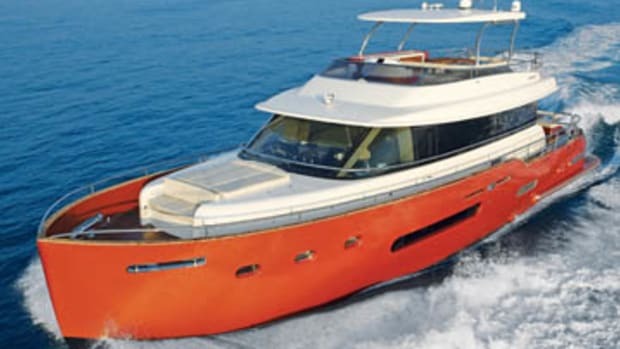 In hard turns to starboard, the boat heeled and carved its way round with great enthusiasm, rewarding the driver’s input with thoroughbred handling—although it seemed markedly less willing to repeat this trick to port, which the Azimut skipper said was a simple issue of rudder adjustment. It’s true that Hull No. 1, which has also been used for press trials, displayed no such shortcomings. It would be fixed before delivery. 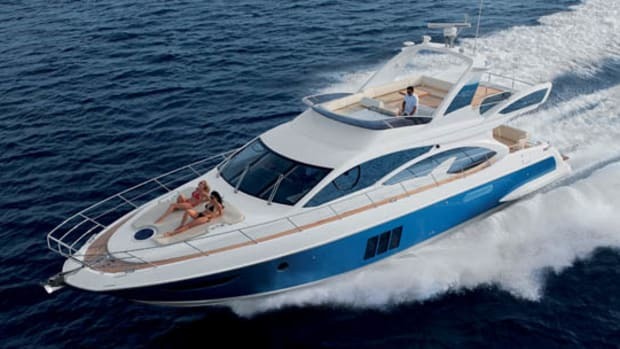 In general, the 53 provided an enjoyable, responsive drive underpinned with the sort of solid, reassuring ride that always proves popular with guests. Everyone onboard should be happy. In fact, the 53 is the whole package—a combination of looks, performance, handling, and accommodations that is hard to fault. There might still have been snow on the distant mountains behind the city, but there was a definite feeling of spring in the air. Those shipyards that plan to weather these challenging conditions and emerge from the economic maelstrom more fit and stronger will need to keep their focus and concentrate on producing solid, attractive, and high-quality products—like this one. 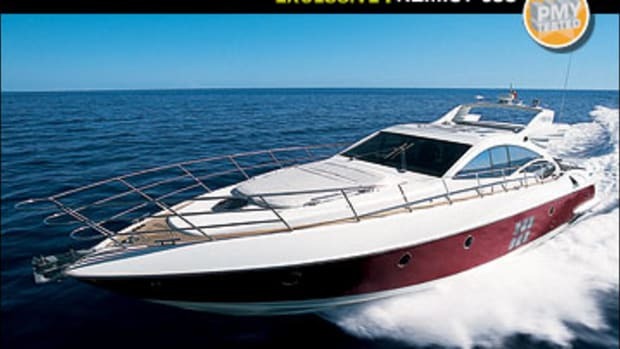 Azimut (+39) 011 93 161.